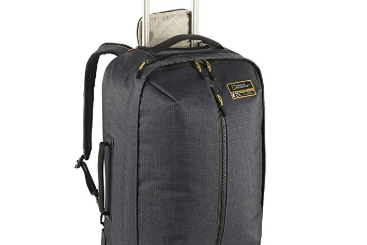 Samsonite S’Cure (49308) is a 28-inch size hard side spinner luggage with a textured finish. It comes with the Deco Gear Ultimate that is made of ten pieces of luggage accessory kit. As a very new release travel product with a unique design, it is rated 5 out of 5 stars at the time of this review. You can get it in either blue or crimson red depending on what you prefer. 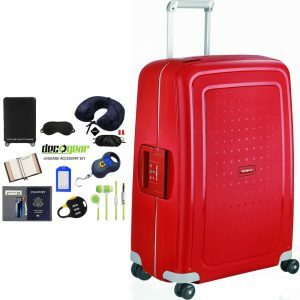 It is actually the first luggage without zippers that we reviewed so far on this site. And this adds to the security of this great bag. The exterior is made of a special polypropylene material mix that enables tinnier shell, while maintaining the robustness. There are four solid double spinner wheels underneath that are easy to maneuver and rotate effortlessly 360 degrees, by holding the retractable handle that feels very sturdy and that locks at three points. The wheels are quite small but have a unique design and are very sturdy and not likely to break easily. The three step locking handle hides itself nicely when not in use and helps with the very easy movement of the suitcase when pulled out without no weight on your arms. There is a built-in three digit combination TSA lock that only the TSA staff at the airports can open your suitcase without needing to break the lock. So you can have a peace of mind, in case your luggage needs to get searched before the flight. The three point locking on the handle of this unit is actually a patented feature. The Samsonite S’Cure is a unisex luggage that can be used by both men and women (blue vs red). Whether you choose blue or the crimson red, the S’Cure is easy on the eyes- looks very nice and modern. It is quite sturdy and lightweight and you probably wouldn’t want to sit on it as it may get damaged. You’ll find that it feels pretty robust when all the three clasps are shut. One of them has the three-digit combination lock and the other two come with the plastic sliders so as to stop the opening by accident. It is very spacious inside and has the organizational zipped pockets for your smaller items or things that you want to separate from your clean clothes. The elastic cross straps in the main section ensures your clothes stay put during your journey. Being a large 28 inch suitcase it can’t be used as a cabin bag and needs to be checked in at the counter prior to your flight. 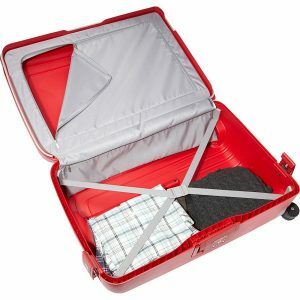 It is offered at a very reasonable price at Amazon.com and we highly recommend it if you want a large suitcase that is easy to use and that lets you pack quite a lot of your stuff. With such a modern Samsonite suitcase, you’re getting what you pay for. One of the customers commented that it looks just like in the photos at Amazon.com.